My friend and collaborator, Mary Lou Hess, has etched hundreds of plates and pressed thousands of images over the course of her long career as a fine-art printmaker. But perhaps ninety percent of these prints bear variations on just three images. Tree. Sun. Moon. These three archetypes of life, light and shadow recur throughout her work. In the books we’ve produced together and in her prints that hang on the walls of my home, it is the byplay of these elemental and resonant figures that catches the eye. Each is drawn from the natural world. By observation. By memory. Sometimes they reflect a mood of loneliness; other times, pure delight. Some haunt, some stir, some tease the viewer. Tree. Sun. Moon. For decades, she has mined their depths, uncovering nuance, combining in new ways their metaphoric meanings. Artfully, with acid and ink, press and paper. I am drawn to the idea of this economy of imagery. Imagine each of us — writers and artists — making the most of the objects that are keystones to the architecture of our own imaginations. Think of us recycling those favored, fraught objects rather than feeling required to manufacture new ones each time we meet a fresh page. I like to believe we each carry such visual and verbal talismen with us. Monet had his water lilies, ballet dancers and baths. Try, if you can, to count how many of his paintings feature these elements. For the French writer Marguerite Duras, there were the tropes of the older lover, the woman-child, the Asian landscape. She wrote at least four books and a movie, reclaiming and revisioning that triumvirate of desire, innocence and alienation. For Mary Lou, there is a tree and a sun and a moon. What about you? What are the recurring images in your writing? What objects and experiences have taken up permanent residence in your psyche? How do you deal with these immoveable objects? Why are they there? What do they mean to you? For me, the images that resurface time and again are water and hands and a familiar voice, singing or reading. These images have been part of my life for as far back as I can remember. Water and hands took shape in my imagination from the days of watching my favorite aunt, a compulsive hand-washer, practice her ablutions at the bathroom faucet. At first, water and hands appeared literally in my writing as I began to write about her. But over time the images took on other lives, bigger lives, emotional, psychological, anthropological lives. 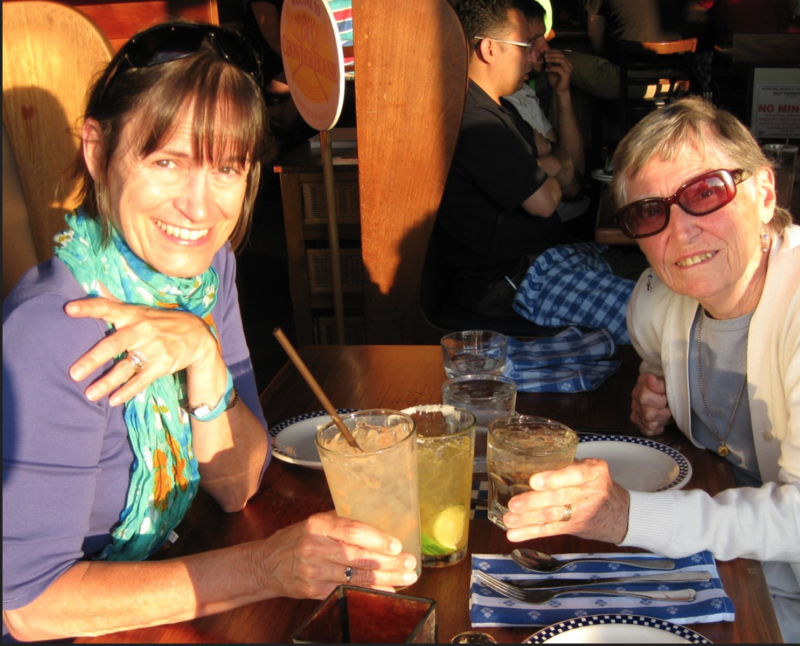 Writing about my aunt, I realized that the reality of water played out in multiple ways for her and the rest of my mother’s family. They struggled through and survived the Great Ohio River Flood in 1937. To support his family, my grandfather started an ice delivery business, selling giant blocks of frozen water, first from a horse-drawn wagon and later from a truck. Water rose up to greet me everywhere I turned in the narrative of my family. The same with the voice. My mother reading me poems. My gruff grandfather, remembered for loudly and rhythmically chanting each customer’s order as he returned to his truck. My grandmother singing me Irish lullabies. Voices gone but still heard. Last year, though, it was the icon of “the hand” that dominated my writing and my life. It started in late summer, as I was preparing for a trip to France and for a week’s writing residency immediately after the overseas trek. 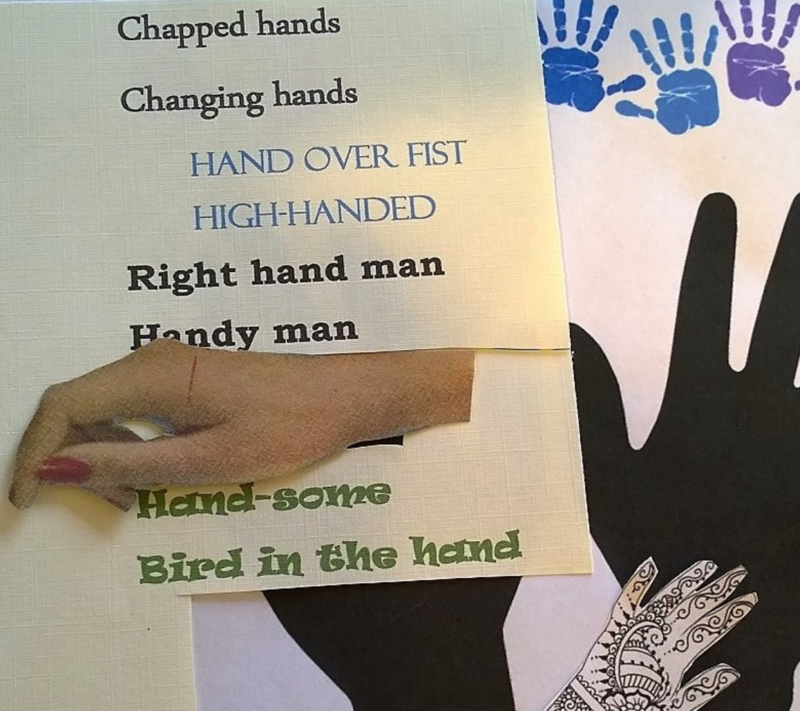 I took a class in collage – which is, after all, all about images — and soon found myself searching for representations of hands. This seemed reasonable, given that I planned to write about my hand-washing aunt on my retreat. Clearly my unconscious was lobbying for me to use my own hands to cut and paste and mound other hands on canvas. I began hunting for all sizes and shapes, anatomically correct and cartoonish, the hands of arthritics, the hands of masseuses, hands outstretched and hands tensed in fists. Hands under water. I filled a folder full of them. I also searched for idioms containing the word “hand.” Handy man. Unhand me. Hand over fist. Heavy-handed. Handsome. Right hand man. I typed up a list that spilled over to a second page. I spent days amassing paper elements and verbal ones. When I packed my bag for Paris, I had to fight with myself, not to slip in between my jeans and sweaters a handful of all those fabulous hands. I swear as I flew across the country and over the sea, I dreamed of hands. And then: On my first morning in Paris, in the Louvre, I slipped on a stair and felt myself hurtling forward. I tried to stop the fall — yes, with my hand. My right hand. My dominant hand. My oddly bent and suddenly misshapen, purple and swollen hand. Sometime after the ambulance ride across the Seine, sometime after the x-rays and the diagnosis (“needs surgery”), sometime after the comforting French words of the handsome French doctor, sometime after the flight back to Seattle the very next day, sometime after the surgery was scheduled for the plates and the screws to be placed, it suddenly dawned on me. I had been handed another layer of meaning for the image that has followed me throughout my life. Another hand to play, if you will, in my recurring game of wits with the hand. Six months later, I’ve gone back to the drawing board with my hand-over-hand collage project. I’ve beefed up my collection of images with photos of the running stitch of my surgical scar; the x-ray showing the titanium plate and screws that now embrace my radius; the before-and-after snapshots that contrast the relative elegance of a French bandage with the techno-pragmatic American version. All of this will go into my collage eventually. And, in some form or another, into my writing. There was a time I thought re-using images, relying on a few objects to carry a great weight, was a literary cop-out. I don’t believe that now. I look at Georgia O’Keeffe and her flowers and bones. I skim the pages of Yusef Konumyakaa, my eyes resting on his old women and jazz musicians and ghosts. I read Joyce, and everywhere is water. I recall John Steinbeck’s work and think, of course, of animals. I believe that the images we carry with us over the long haul of our lives, the objects and experiences that are bound in memory, that rise up in the same and differing versions again and again, are there to guide us to something deeper that we know is true. That truth doesn’t always show up the first time we dig into the fertile ground of our familiars. The first moon my friend Mary Lou etched onto a metal plate and pressed against paper may have done the trick for some artists. But she wanted more out of her moon. She wanted to understand it. Its shape and texture. Its influence on its environment. Its unnatural natural light. She etched it high in the sky, low above a river, tucked between clouds, floating over mountains, rippling in water, half-hidden in woods. My guess is she will be etching moons right up to her last landscape. Just as my hand will do what it always does – trace the circle of that moon, feel its texture on the page, grasp the wonder of our collective imagination. 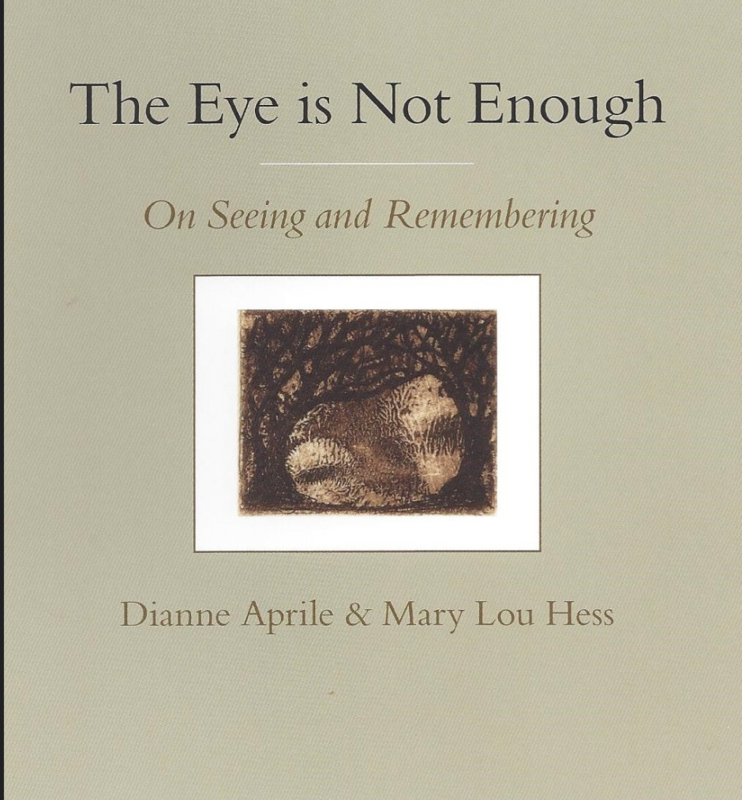 Dianne Aprile has published four books and edited several others, most recently The Book (Images, 2014.) In addition to mentoring in creative nonfiction at Spalding, she teaches writing classes at Seattle’s Richard Hugo House and Kirkland Arts Center. In a former life, she was an award-winning journalist and newspaper columnist, and co-owner of a jazz club. She’s received fellowships from Washington state’s Artist Trust and the Kentucky Arts Council and a Hedgebrook residency on Whidbey Island, WA. Her most recent (and most highly anticipated) honor was becoming a first-time grandmother in May, 2015. Dianne, what a marvelous blog post! Now I’m thinking about my recurring images and threads–rocks, birds, music… Thank you! Dianne, I am crazy about this lecture! Many years ago I heard that one’s favorite fairy tale is significant in the way we see ourselves in life. Now, I am going to research my work’s most-used images like you did, and see what surprises I find. Thank you for leading the way. This is a beautiful essay! I’m thinking about the differences and similarities between the images we’re very conscious of repeating and the ones that exist below our own radar. As I’ve been working on a poetry manuscript, I’ve been surprised by how many birds there are in my poems. I don’t even like birds! I don’t ever remember setting out to write a poem about a bird, but they’re all over these poems, and I probably have to write even more bird poems to figure out what they mean.